Check-In to Bakerzin Outlets & Unlock Sweet Treats! Wednesday | November 30, 2016	Bakerzin introduces another exclusive deal for Rewards members this season of gifting! Apart from the exciting members benefits when you sign-up as a Rewards members, you can now unlock sweet treats whenever you check-in to any Bakerzin outlets. To qualify, simply follow these simple steps to register: 1] 1st of all, pre-requisite is of-cos to be physically at any Bakerzin outlets 2] Turn on your mobile Wi-Fi 3] Search for SSID: "Bakerzin Check-In" & Connect 4] Launch any Internet Browser - Check-In page automatically loads 5] Log-In as an existing Rewards members OR Sign-up if you are new 6] Upon successful log-in/sign-up, sweet treats will be unlocked 7] Click on download coupon and redeem your rewards with our staff Should you accidentally close your browser before downloading the coupon, fret not! It will be stored in-app under "Coupons" which you can easily retrieve anytime. Simple isn't it? You only need to complete the above registration process once and be able to receive future location-based promotions whenever you check into any Bakerzin outlets with your Wi-Fi turned on. 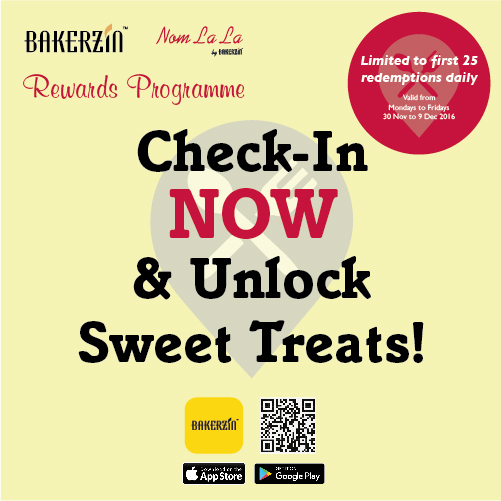 Be the first 25 members to check-in from now till 9 December at any Bakerzin outlets to Unlock Sweet Treats!